I don’t know about you, but when I think of terrible crimes such as murders and abductions, I automatically think of countries like America. This may be because most movies, television shows and books of this nature seem to come from the States (and this has shaped the nature of my views), but for some reason, I never really think of Australia as a place where these things can happen in everyday life to normal citizens. Unfortunately, as Justine Ford’s book points out, these unthinkable crimes do occur in Australia- often in our own suburban towns, and often to people who are just like us. Borrowing a similar style platform to the true crime television show Australia’s Most Wanted (on which Ford actually worked as a reporter), Unsolved Australia looks at eighteen homicides and disappearances that have stumped the police trying to solve them. While some of these cold cases are only a few years old, others have gone in and out of the policing archives for over forty years, as police attempt to solve them, and bring closure to the families left behind. However, despite consistent efforts from detectives and investigators, there is only so much that can be done without public assistance, which is where this book comes in. Rarely does a true crime book lay out the intimate facts of an unsolved case and allow the armchair reader to offer their own contributions towards solving it. But the author hopes that people reading Unsolved Australia may know something about a particular case, and come forward with some new information that closes these cases for good. Each of the stories have all the bare facts laid out, as well as relevant information about all suspects and/or witnesses that police have interviewed over the years. Ford also provides in-depth interviews with family members, friends, the police, and those searching for the truth about what happened to their loved ones, in the hope that someone, somewhere, may know something. To help break up the gruesome and depressing nature of the stories, the author has also included profile interviews of people who work within Australia’s crime-solving network. These include interviews with forensic pathologists, biologists, and anthropologists, a defence barrister, a missing persons counsellor and a victims’ advocate- shining a light on some of the people involved in solving Australia’s most baffling crimes. This book, in a similar vein to most true crime books, is not for the faint-hearted. Among the tales of people who have gone missing are stories of beheadings and execution-style murders- all of which have occurred in regional Australian towns within the last forty or so years. Even the cover is eye-catchingly creepy (admittedly, this is what first drew my attention to the book), which is sure to please the most avid true crime reading fan. 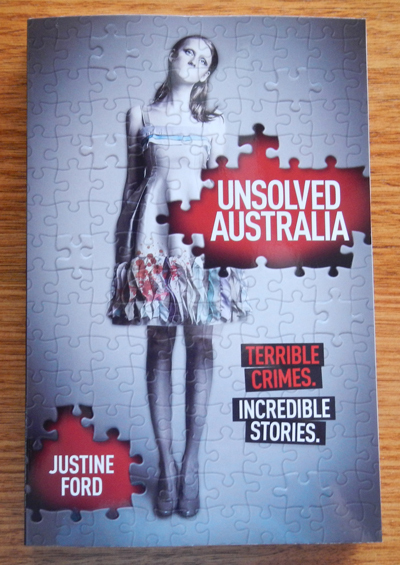 While the topics in Unsolved Australia are obviously unsettling, hopefully this book will meet its purpose, and some of the homicides and disappearances within will be solved as a result. How about advising the COST of the book? That's part of a 'review', IMO. It's the 'cruncher' whether I buy or not. Thank you, Catherine. That's beyond my payment ability. Will get it from local Library, instead, I think!